Mish's Global Economic Trend Analysis: Fed Drops Risk Warnings, Opens Door for December Hike: Who's the Fed Fooling? You, the Bond Market or Itself? Fed Drops Risk Warnings, Opens Door for December Hike: Who's the Fed Fooling? You, the Bond Market or Itself? In its Press Release following today's FOMC meeting, the Fed dropped all the references made last month about the softening global economy. Has the global economy stabilized in the last month? Of course not. Have the risks receded? Of course not. Last month China was a concern now it isn't. Is China any better? Of course not. Moreover, the economic reports from all Fed regions are in contraction, the soaring dollar will further dampen US exports, and the refugee crisis is making an enormous mess in Europe. Nonetheless, the Fed is back to statements similar to those it has made for much of the year. In determining whether it will be appropriate to raise the target range at its next meeting, the Committee will assess progress--both realized and expected--toward its objectives of maximum employment and 2 percent inflation. This assessment will take into account a wide range of information, including measures of labor market conditions, indicators of inflation pressures and inflation expectations, and readings on financial and international developments. The Committee anticipates that it will be appropriate to raise the target range for the federal funds rate when it has seen some further improvement in the labor market and is reasonably confident that inflation will move back to its 2 percent objective over the medium term. Yesterday the odds of a December hike were 33.2%. Today they are 42.6%. That's a decent jump but still below 50%. 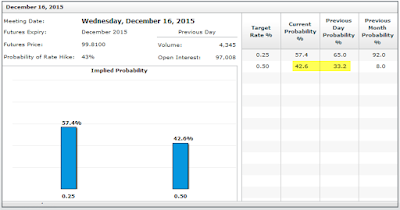 Those odds imply a jump from 0-.25% to .25-.50%. I still maintain the Fed might choose baby step 8th of a point hikes or quarter point ranges where the first step is an eighth of a point. Thus, the Fed might easily hike to a range .125-.375%. Of course, if the next two jobs reports are weak, or even if the December jobs report is weak, a hike is off the table.